Recently while browsing the meat section of one of our local upscale markets, I stumbled upon a package of marrow bones. I had no experience in the kitchen with them, so I bought them. The other night, I served the bones for the first time at a dinner party, accompanied by thick grilled slices of my homemade bread. “What’re those?” one guest asked. “Are those bones?” said another. Three of the six of us indulged; the other three carried on with conversation and glanced periodically at us and the bones, their faces betraying curiosity and slight alarm. I guess in our tidy American culture, it can be a strange thing indeed to be served a plate of bones. But the times are changing. Gastrofriend Greg and I, while sitting at the bar of a trendy gastropub with our tequilas and beer researching for one of my “best burger” posts, observed several orders of marrow bones going by. We ordered some and when it was time to leave, Greg asked me which of the several burgers we tried had I liked best. “The marrow,” I replied. 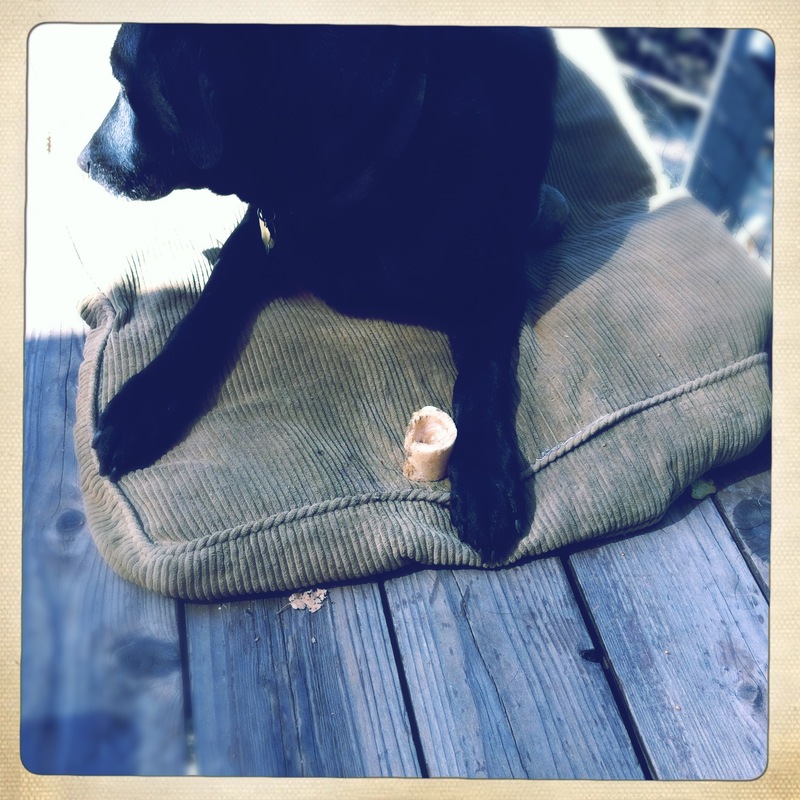 I figure if you’re going to eat the hamburger, you should be willing to try the bone. And once you get past the sheer carnality of the experience, eating marrow bones is actually quite a subtle culinary pursuit. The bones themselves roast up to a lovely alabaster, and arrange architecturally on the plate (I used a black plate for added drama). The fatty roasted marrow spreads even silkier than butter on thick slices of grilled bread, the taste complex and rich, yet not the least meaty or overwhelming. The quality of the bread and the salt are critical for this dish, as each will bring out the silky and subtle characteristics of the marrow. The day before you’re cooking, place the bones in a large bowl of salted water in the fridge. Change the water once or twice over 12-24 hours (this process removes any blood from the bones). Heat a large pot of water over high heat to a boil. Add bones, reduce to a simmer over medium heat, and cook for 10-12 minutes. Remove the bones from the water to a plate and let cool. While the bones are cooling, brush your bread slices lightly with olive oil and grill over high heat — either on an indoor grill or outside on the barbecue — until they’ve got grill marks and are beginning to burn slightly on the edges. Make your fried parsley: Pick stems with several leaves on them, and make sure the parsley is dry or else the water will splatter in the oil. In a small pan, heat 1/4 cup oil (grapeseed, canola or olive) over medium high heat. Drop a few stems at a time into the oil and cook for 15-20 seconds, until crisp. Remove to a plate lined with a paper towel to drain. 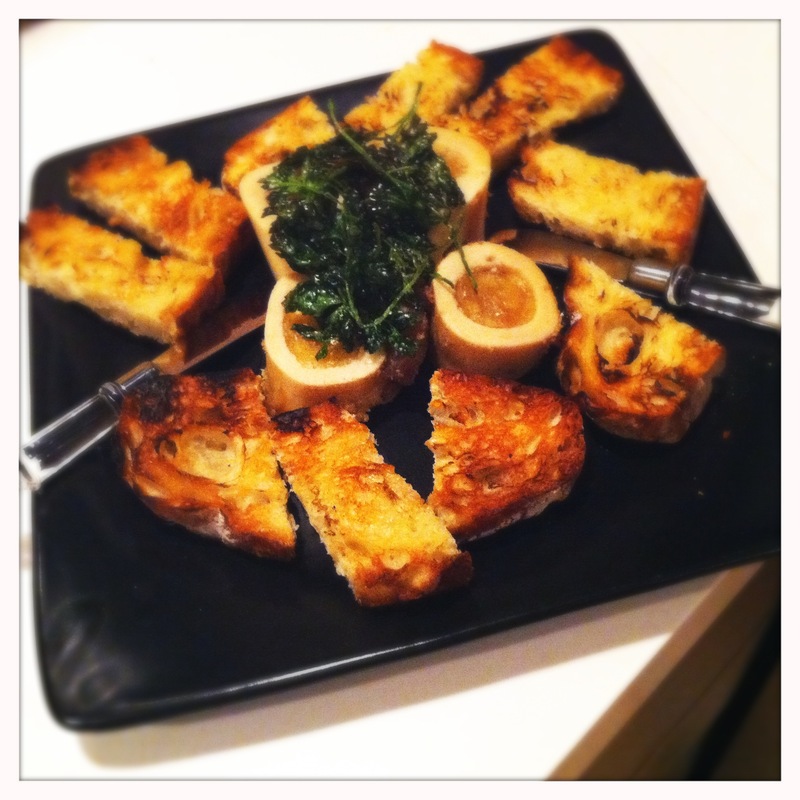 Brush your marrow bones with olive oil, and place under the broiler in a hot oven for 3-5 minutes, until browned. Remove to a plate and surround with slices of grilled bread. Top bones with fried parsley as in the photo above. Serve with small knives for scooping the marrow out, and your finest flaky sea salt for sprinkling over the bread. Bonesucking since I can remember–even chicken bones. Oh, yum. We always get marrow bones at Prune when in New York. Much to the horror of a friend who dined there with us once. As you say, made more for us! I had some marrowbones at (probably) the same gastropub you went to. And I recall they were a bit too rich for my tastes. Although I’m willing to give them another try just to be fair…hint. hint. You bake a boule, I’ll get the bones! I need to make this at home. I live two-short blocks from Michellin-starred http://www.longmanandeagle.com/ and they serve some awesome bar food including roasted marrow bones with grilled sourdough bread and onion jam. It grosses out my wife so I get to eat the whole thing myself. BTW, I realize I’ve been MIA. I’ve been unemployed for seven months and I just got a new job (I’m a psychotherapist.) and I’ve also been studying for my final state boards. Hope all is well in Cali. Grilling season is upon us and quite by accident I’ve discovered the best way to make shrimp cocktail. Last night I made surf & turf to commemorate the premiere of Mad Men except my wife & I were full after eating our grilled artichokes and ribeye. The prawns had been marinated in EVOO, lemon juice, fresh garlic, and salt/pepper and the grilled on the Green Egg. The next day, chilled, they were absolutely the most flavorful prawns I’ve had dipped in a mixture of Heinz Chili Sauce and horseradish. (Old school, I know.) I don’t think I’ll ever boil or steam my prawns ever again! Speaking of sourdough, have you ever used Lalvain sourdough culture? It’s awesome. It’s useless to maintain a sourdough starter here in the Midwest because the native yeast in the atmosphere, while a powerful leavener, produces little to no acidity. Hey man! Was thinking about you the other day and wondering where you dropped off to. Congrats on the new job. Yeah, that “grosses the wife out” thing works out beautifully, doesn’t it! My wife’s gross outs include marrow, sea urchin, oysters… how lucky am I? OMG, I went to L&E tonight to celebrate. (My birthday and that I passed my final state boards as an independent psychotherapist.) The marrow bones had candied kumquat added to them. OMFG! It was awesome, and has led me to the decision to lend you the secret to my Mojito’s. Make as usual, however, earlier in the day, slice a batch of kumquats lengthwise and macerate with sugar and a touch of rum. Later, when muddling, add the kumquats in with the mint and proceed as normal. Mojitos of the (g)ods. Loved by all. The bitterness of the kumquat is perfection when added to the traditional Mojito. Share my secret with discretion. (Also, kumquat vinaigrette is killer with asparagus.) Stop, Ben. Stop sharing secrets! How am I to share with discretion when you’ve just posted on my blog for all to see!?? Great tips, Ben. As you know, when kumquats come, they come in droves (like summer zucchini). So it’s always good to get tips for what to do with them. And yours sound divine.